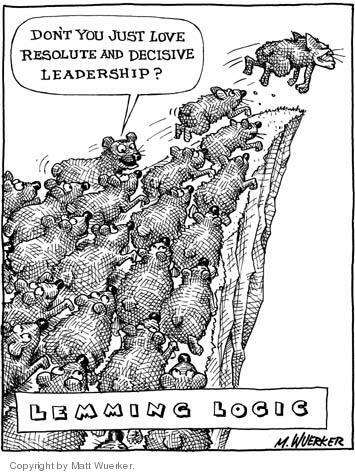 Climate Common Sense: The Lemmings Are Running Faster! Mother England, who has gifted to the world a near universal language, a stable system of government and a unique culture, and has weathered countless attacks,wars, pestilence and famine, is now facing it's greatest threat to survival. In 1917 Germany sent Lenin to Russia in a closed train like a virus to destroy the Russian government and weaken it's people , and there are parallels with the way global warming ideology has infiltrated and is destroying the UK from within by attacking it's life support system - the electricity generation system that warms and powers the whole country. It is no secret that in war-time the first major targets to economically cripple a country are the power stations and electricity grid. The latest pontification from the UK Government Committee on Climate Change suggests that a target of 60% reduction of emissions be achieved by 2030. This may be easier than they think as when the economy collapses under preposterous Global Warming regulation ,so does CO2 emissions as witnessed in the recent Global Financial Crash. The UK would cut its greenhouse gas emissions by 60% by 2030 under world-leading proposals from the government's advisers on climate change. Achieving the target proposed by the Committee on Climate Changerequires a complete revamp of the nation's electricity market, making it virtually zero-carbon, as well as an overhaul of heat-leaking homes and the replacement of petrol-driven cars with 11m electric or plug-in hybrid models. The CCC's 2030 target, if passed into law as previous CCC targets have been, would be the first legally binding 2030 target in the world. The target – which is a cut relative to 1990 emissions levels – is intended to lead the way to a legally binding 80% UK cut by 2050. "We are recommending a stretching but realistic fourth carbon budget and 2030 target, achievable at a cost of less than 1% of GDP. We therefore urge the government to legislate the budget, and to develop the policies required to cut emissions," said Lord Turner, who is the CCC's chair, as well as chairman of the Financial Services Authority. "The case for action on climate change is as strong as ever: climate science remains robust and suggests that there are very significant risks if we do not cut emissions. And countries acting now will gain economic benefits in an increasingly carbon-constrained world." The UK wants to be the fastest lemming in the race with a "stretching and realistic fourth carbon budget". I would choose different words - more like "moronic and suicidal"